Professor Okafor has published extensively in the fields of international human rights law and immigration/refugee law, as well as general public international law (especially with regard to third world approaches to international law). He is the author of The African Human Rights System, Activist Forces, and International Institutions (Cambridge: Cambridge University Press, 2007); Legitimizing Human Rights NGOs: Lessons from Nigeria (Trenton, New Jersey: Africa World Press, 2006); and Re-Defining Legitimate Statehood (The Hague: Martinus Nijhoff, 2000). He has co-edited three books: Legitimate Governance in Africa: International and Domestic Legal Perspectives (The Hague: Kluwer, 1999); Humanizing Our Global Order: Essays in Honour of Ivan Head (University of Toronto Press, 2003); and The Third World and International Order: Law, Politics and Globalization (Leiden: Martinus Nijhoff, 2003). He has edited three special journal issues, and published over seventy (70) journal articles, book chapters and other scholarly writings. He is the Editor of the Transnational Human Rights Review, and sits on the editorial advisory board of a number of scholarly periodicals. He is currently working on a SSHRC-funded partnership development research and dissemination project relating to Canadian/Nigerian human rights engagements; and on a project examining the comparative character of refugee rights in Canada and the USA post 9/11. He is also planning to begin a large multi-year study on Canada’s Human Rights Role in Africa (CARRIA); as well as a smaller study of the role of critical third world international law scholars in socio-economic and political praxis under the auspices of the emergent, Osgoode-anchored, Research Network on International Law in the Global South (RENILIGS). Professor Okafor is the UN Independent Expert on Human Rights and International Solidarity (one of the principal group of human rights experts who advice and report to the UN Human Rights Council and General Assembly) and a former Chairperson of the United Nations Human Rights Council Advisory Committee (a Geneva-based committee of experts elected by the Human Rights Council to serve as its think tank and principal subsidiary organ). He has also served as an expert panelist for the United Nations Security Council’s Counter-Terrorism Committee and United Nations Working Group on People of African Descent. And he has worked as a consultant or adviser for several international organizations, government agencies, parliaments, and law firms. Professor Okafor is the founder and convenor of Osgoode’s Research Seminar Series on International Law in the Global South (ILIGS), and of the Annual York University Oputa Lectures on governance in Africa, which has been held at Osgoode since 2004. 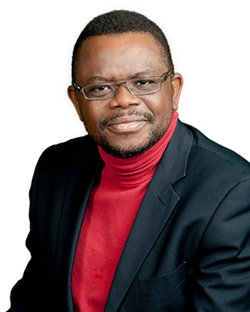 Between 2009 and 2011, Professor Okafor chaired the Curriculum Reform Working Group, whose work led to important reforms in Osgoode’s upper-year JD curriculum, including the introduction of the praxicum, and additional upper-year writing requirements. He also founded the international and transnational law intensive program at Osgoode, and engineered Osgoode’s participation in the prestigious International Court of Justice University Traineeship Program. Graduate Research Supervision (LLM, PhD): Professor Okafor is most interested in supervising excellent students who have already demonstrated a strong capacity for academic research and writing, and who also have an interest and experience in International human rights law (especially human rights in Africa), and public international law (especially students who work within and with "Third World Approaches to International Law or TWAIL).